Beets are the secret to this tasty dish -- they give the pasta a subtly sweet and nutty flavor and an electric pink color. This dish is perfect for getting picky kids to eat their veggies, and Animal is sure to approve! 1. Peel and quarter the beets. To keep the dye from staining fingers, peel beets under cold running water. 2. Place peeled, quartered beets in a medium saucepan filled with cold water. Bring to a boil and then simmer until tender, approximately 15 - 20 minutes. 3. While the beets cook, heat the oil in a sauté pan over medium-low heat. Add the thinly sliced onion and 1/4 teaspoon salt. Sauté the onions until they are soft and lightly golden, approximately 10 minutes. 4. Strain the beets and let cool. 5. Purée cooled, cooked beets and sautéed onions in a food processor with 2 tablespoons of Ricotta cheese. 7. Cook and drain spaghetti. 8. 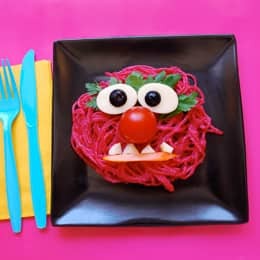 Place cooked spaghetti in a sauté pan with beet sauce. Cook, stirring constantly over low heat until the sauce is heated through and pasta is coated in sauce. 9. Place the pasta in the center of the plate. 10. Cut mozzarella 1/2" thick and then cut two oval shapes for eyes. Trim the scraps of cheese into tiny teeth. 11. Lay Italian parsley on top of the pink pasta, as eyebrows. 12. Place mozzarella eyes topped with black olive pupils on top of the eyebrows. 13. Use a cherry tomato for Animal's nose and a sliced yellow pepper for his mouth. 14. The mozzarella teeth should be placed above the yellow pepper mouth. Serve with shredded Parmesan cheese.